Today we sailed into the French Caribbean, complete with Nutella-filled crepes. 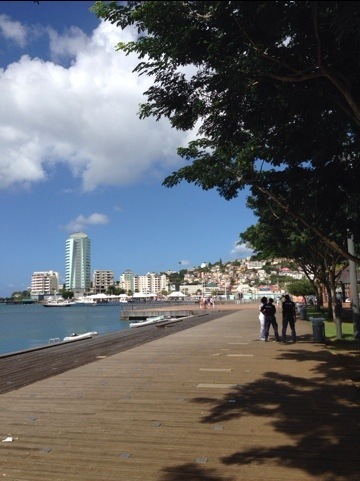 In fact, Fort-de-France (aside from one unfortunate and out of place, IMHO, bit of new construction on the waterfront) even looked like a town on the French Mediterranean with its colorful buildings rising up the surrounding hillsides. The impression remained once on shore. The sounds of sirens, names of streets, and available stores/brands–all very French. Needless to say, I felt very at home paying for our aforementioned Nutella filled crepes with euros. We’d debated exploring more of the island, but opted to remain in town because taxis are very pricey and the ship’s shore excursions didn’t work for us. Unlike many islands, Fort-de-France was a genuinely interesting place to explore in terms of its architecture and vibe. It felt far less touristy and far more genuine than many ports that are overrun by the same brands of duty free shops. After spending the morning on shore, we returned to the ship for lunch, a couple of rounds of mini golf, some time in the kiddie pool, and a map. We then had dinner at Portofino, the ship’s Italian specialty restaurant (which I also won’t review as we’ve “been there and done that” a few times before). Emerson was again good for us; she seems to like eating in an upscale atmosphere. After dinner, we went to the Crown and Anchor Society’s “top tier” event and got to chat with the ship’s captain for an extended period of time. We then attended the 9:00 seating of the stage show, which Emerson thoroughly enjoyed–despite it being well past her usual bed time.